Living with chlorine in your city water is no laughing matter. 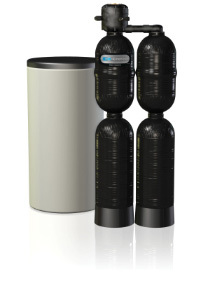 Therefore, choosing the best water treatment solution is top priority. Chlorine has been chosen to treat bad water in communities throughout the world. However, chlorine has both its advantages and disadvantages. In this case, the disadvantages outweigh the advantages. Too much of a “good thing” can actually cause more harm than good. The properties found in chlorine are designed to kill microorganisms found in ordinary everyday water supplies. However, these same properties can cause sickness and illness, in the very people it is designed to protect. At Schultz Soft Water we are committed to helping our customers obtain clean, safe water. We offer water treatment products that meet the needs of families throughout the area. We understand that all family needs are different, but when it comes to staying healthy and eliminating a possible threat, the needs are much the same. Chlorinated city water with all its good intentions comes with an unhealthy price, which families are not willing to pay. Toxins or impurities that chlorine does not remove, our products do. By removing chlorine from city water and other undesirable water contaminants, our customers enjoy chlorine free solutions and pure water that help communities stay healthy. Chlorine is a gas. It is often referred to as bleach and used as a disinfectant agent. Sodium hypochlorite is an active ingredient found in chlorine which slowly travels through the water supply systems. As chlorine is released into the body, the oxidizer is so powerful, it actually begins to attack bacteria found in tissues and other organisms. Although, chlorine is used by city water plants to disinfect the public’s water supply, chlorine can do harm to the body over time. Chlorine causes damage to the hair, eyes, and skin, due to its aggressive oxidizing effect. Chlorine kills bacteria that cause diseases. When contaminated water enters the treatment plant, it usually comes back free of some toxins, and loaded with others. Why is Chlorine a Problem? The biggest problem with chlorine is its inability to effectively protect individuals from serious side effects. Families cannot treat the entire community, but they can treat the water that enters their home. While chlorine does an excellent job of destroying most toxins that travel through the water supply, it also introduces other types of toxins, which are just as deadly, called trihalomethanes. These compounds are now subject to many medical research studies and have been linked to variety of health concerns. When trihalomethanes enters the body, the possibility of people contracting asthma, heart disease, eczema and bladder cancer increase. Even pregnant women are at risk for miscarrying or delivering a child with birth defects when they are introduced to the toxins found in trihalomethanes. How Can Individuals Protect their Families from Tap Water Toxins? Whole house de-chlorination is a great way for homeowners to protect their families from free radical toxins. Installing a whole house water treatment solution, offers more safety features and more security from “bad water” than countertop/refrigerator filtering systems. Schultz Soft Water has been helping customers protect their water supply, their families and their community for decades. We understand the challenges customers in the community face, when it comes to finding an effective, cost efficient water treatment solution. This is why we offer customers treatment solutions that are customized to fit their particular need. Our approach to de-chlorinating “bad” tap water is to install a water softener/filter combination system, and not a single point of use filter. Point of use filters are designed to work in one location, or to address one problem. Placing a filter at the sink only filters the water coming out of that particular faucet. The rest of the water supply can still have undesirable contaminants. We believe that our customers should only pay for what they need. We install customized treatment solutions to provide clean, safe water for the whole house. Our customers have access to clean drinking water twenty-four hours, seven days a week. Our whole house water treatment solutions can eliminate contaminants before they can enter the body and cause irreversible harm. At Schultz Soft Water we offer personal, custom and individual whole house systems and drinking water solutions. We know that our customers can find a solution that is perfect for their needs. Before we introduce a solution to treating contaminated water, we conduct a physical water test, so we can best understand what our customers’ needs are, and what steps we need to take. Once we get the results back, we will sit down with you, and offer several practical, effective and affordable options to eliminating your problem. Chlorine is still the most cost effective way for municipalities to sanitize the water and most likely will remain for many more decades. There are drawbacks from chlorinating water supplies, but that is usually left for the homeowner to discover and treat in their own home. At Schultz Soft Water we have many solutions to help you with whatever water issue you may have. We believe clean water makes a “healthy” difference.